TAG Heuer's been showing off a bunch of its watches in Geneva, and one model, in particular, has caught our eye. In addition to the new smaller and cheaper Modular 41 announced yesterday, TAG Heuer has been teasing a diamond-encrusted white gold version of its Modular 45. This Android Wear-powered ostentation can be yours for a mere $200K (190’000 CHF). 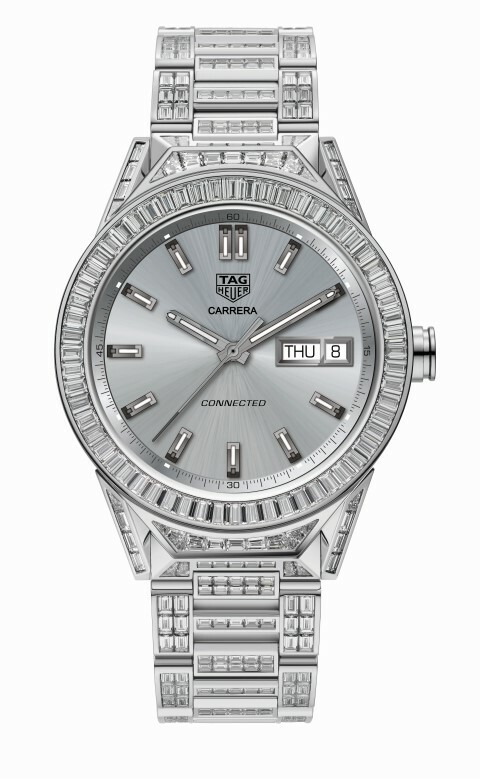 The watch is part of TAG Heuer's Modular 45 series, though this model has the "Full Diamond" name attached to it as well, which makes sense. 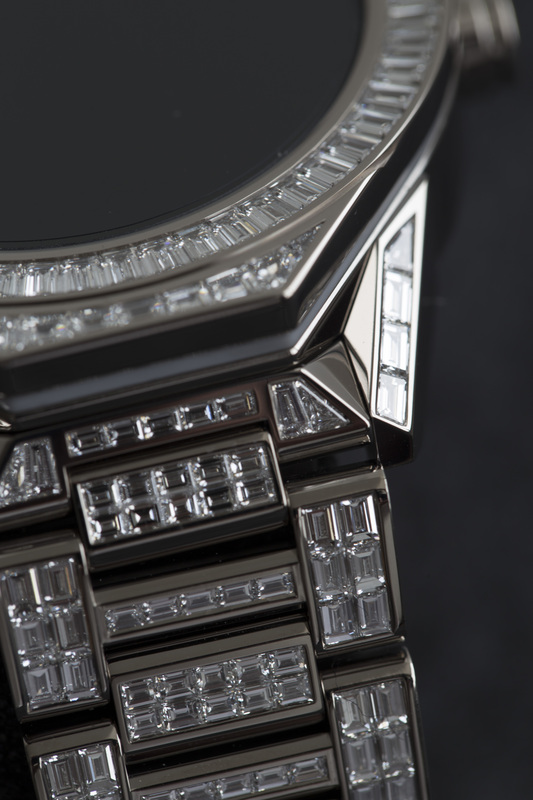 With 589 diamonds spread across almost every exterior surface on the bezel and bracelet (totaling 23.35 carats), it's pretty full of them. All the bits that aren't diamond are a much more pedestrian 18K PD125 white gold. We took a look at TAG Heuer's Modular 45 ourselves, and at the original $1,500 price we didn't find it to be a terrific value. At closer to $200K, what was already overly expensive turns into a bit of a joke. Even if, for some reason, you're willing to spend the extra money on the diamond version, it's missing too many features to be a decent Android Wear device, though TAG Heuer is including an auxiliary mechanical watch for when it's inevitably obsolete. If you're still interested, you can zip over to Geneva for a fraction of the price and check it out for yourself while you wait for the option to appear in TAG Heuer's watch selector. During a March press conference in Brunnen, Switzerland, TAG Heuer unveiled its new Connected Modular 45, the first Swiss Made TAG Heuer modular watch. 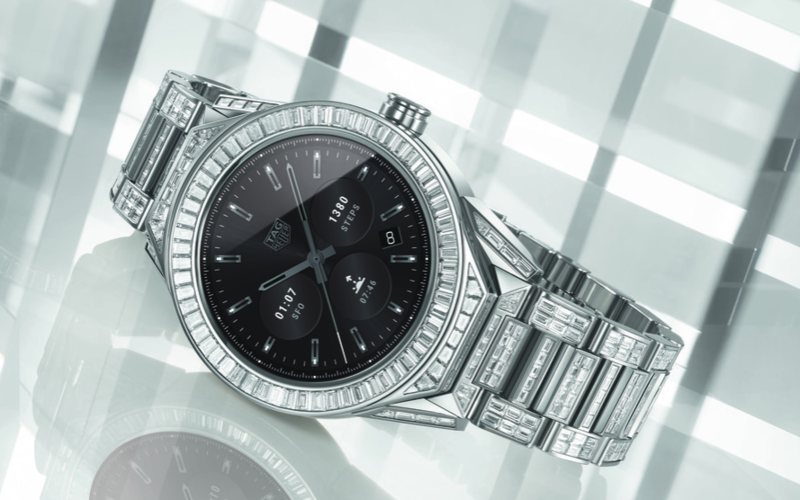 True to its image as a luxury Swiss watchmaker, it was a natural step for TAG Heuer to release a connected watch with a classic design, made not just from modern materials such as titanium, but also precious materials including white gold and diamonds. This latest version from TAG Heuer is fully paved. The 45 mm case is in 18K PD125 polished white gold, and 589 VVS baguette size diamonds adorn the bezel (78), the lugs (16) and the bracelet (495). A total of 23.35 carats. This horological jewel comes with a Calibre 5 mechanical module also in a shimmering version featuring a bezel set with 72 1.5 mm diameter diamonds. The set is presented in a magnificent case in luxurious and subdued colours. Developed in collaboration with Intel and GoogleTM, the TAG Heuer Connected Modular 45 Full Diamond has all the elegance, features and finishes of a fine wristwatch. This Swiss Made luxury watch incorporates the 150 years of expertise, knowledge and heritage behind TAG Heuer, a watch manufacture established in La Chaux-de-Fonds, the cradle of Swiss watchmaking. Remember that this watch represents an original concept, never before seen in the world of connected watches: the connected module is interchangeable with an Haute Horlogerie mechanical module — a 3-hand watch Calibre 5, Chronograph Calibre 16 or COSC-certified Chronograph Tourbillon. The modular concept also applies to the lugs and the bracelet. It is water resistant to 50 metres and features GPS, an NFC sensor for payment, a superb, very high definition AMOLED screen and numerous infinitely customisable TAG Heuer dials, with Google Wear 2.0 and a new Companion App to enhance the software experience.